Settlers of the Ostingele VII colony found the jungle planet to be much like their home planet and benefited from the ease in adapting Intaki flora and fauna to the new environment. Early on, two animals in particular thrived on the planet, setting the stage for the colonies development. The first was a small Intaki moth called the kakeeda that was imported for the silken fibers harvested from its cocoons. The kakeeda unexpectedly interbred with a substantially larger native moth, creating a new species called the vishaal. Because of the difference in size, a single season of vishaal harvesting produced as much raw silk as five years of kakeeda farming on Intaki. The silk was also significantly stronger, softer and more lustrous. In addition, herders discovered that the planet’s native grasses produced changes in the physical characteristics of the goats and sheep that they raised. Among these were sleeker and softer wool. Within a decade of the founding of the colony, it was producing large quantities of new textiles, which quickly became the standard for use in Intaki dress and decor. 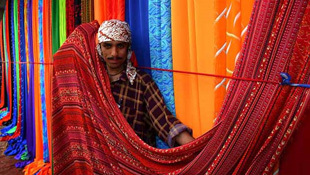 The textile market of Indradhanush – the colony’s capital city – bustles year round with activity. So much money flows through the market, in fact, Pend Insurance Investment Bank has a depository in orbit above the planet. The people came to call the colony Kapda, a name that translates roughly as “the great tapestry of life.” The Kapdan colonists opted for a hybrid representative government, forming a popularly elected unicameral legislature called the Shaastragya Vyavasthaapak. The executive power is given to “The Avatar.” The current Avatar, Sanjeevani, has led her people for 28 years. She is known for her warm demeanor and has made improving the quality of life of her colony’s children her main cause. The Avatar of Kapda is selected from a special portion of the colony’s reborn population. This group, known collectively as the Gurus, serves as both the spiritual advisors and the planetary judiciary. The Gurus have their own standards for admitting members to their ranks and they are not shared with outsiders. However, adepts are ALWAYS reborn and usually between the ages of five and 10 when chosen for membership. To date, no one identified as an Idama has ever been selected. When a reigning Avatar dies, the Gurus convene and select the new. Surprising to some outsiders, Avatars are usually young when chosen, with the median starting age being around 19. Those Guru who have spoken publicly on the matter have stated that because the Avatar is actually a reborn incarnation, their physical age in this lifetime is not an indication of preparedness and by choosing a younger candidate, it helps ensure a long and stable rule. The importance of this is debatable, however, as secular members of Kapdan society note that the actual powers of the Avatar are constrained by the colony’s charter. The Avatar helps shape the Shaastragya Vyavasthaapak’s agenda and serves as the head of state, but has limited ability to assert control over the government. Having the second largest population of the colonies still loyal to the Intaki Assembly and its location on the boarder of Gallente high sec, help to make Kapda a major player in Assembly politics. Generally speaking, Kapdans are the least likely to favor secession from the Federation and the Kapdan contingent in both the Rajya Sabha and Lok Sabha lobbied vocally against the awarding of the development and defense contracts to Ishukone Corporation and Mordu’s Legion. Kapda is also recovering the loss of its daughter colony on Ostingele IV. Although extraordinarily hot, an effort was under way to terraform the planet to serve as a mining colony, allowing access to the planet’s precious metal resources. However, a surprise attack by forces of Sansha’s Nation resulted in the loss of the entire colonial population of 2 million people. Following the tragedy, the Kapdan government abandoned all plans to develop the planet, leaving it to the capsuleer community to harvest its resources.